We worked with Natalie on a complete rebuild of our home from 2016 to 2017. She was highly recommended to us by our builder Silverpoint Homes. We had an idea about how we wanted the house to look but didn’t have the vision to pull it all together. Enter Natalie. What a complete gem. She took time to look at the pictures of what we had imagined our home and went to work. She did not overwhelm us with choices. She pulled ideas that fit in with furniture that we currently had that would return with us and selected pieces that would complete the house as a whole. When we looked back at the pictures we had selected on Houzz as ideas, she had it exactly the way we wanted. I will completely agree with the other reviewers that she is very conscious of the budget and works within in. There were a few items that we went slightly over but well worth it for the final look for what we wanted. In the storm of the renovation, she is definitely a calming force. She is extremely knowledgeable about the process of the construction and is on top of when things need to be selected. She has great contacts and organized ahead of time what we would be looking for at stores to select (fixtures, tiles, etc) which saved us so much time and was very much appreciated. Natalie’s attention to detail amazed me. She selected pictures for our living room and before even seeing it in person had picked up accents and pillows that perfectly match. She also took time to talk with my 10 year old daughter and figure out what she wanted for her room. She came up with some fun choices and designed a room which she will not grow out of for a long time. She took everything into account and designed a home for us that flows perfectly with colours and textures. You will not go wrong working with Natalie. She is pleasant, professional and extremely knowledgeable in design. 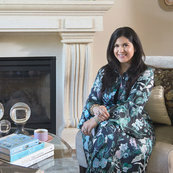 She works within the style of your home and ensures that you are happy with the final product. Thanks Lisa! I very much look forward to our next phase of projects. It was my pleasure working with you both to create a wonderful family home to create many memories in! If you are searching for an interior design company, look no more - NM Interiors is simply the best! Thank you Joanna for your vote of confidence! It was a pleasure working with you and creating more functional, beautiful spaces in your home. I look forward to our future projects!